So What if You Encounter Swine Flu? Since starting this blog two years ago, I’ve spent a lot of time writing about the flu vaccine. Regular readers know my feelings on this completely bogus inoculation–it does nothing. My reasoning behind this belief is two-fold: First, the influenza virus is one of the most rapidly mutating viruses on the planet. The difficulty of developing a viable viral vaccine against such rapid mutation is close to impossible–it’s not entirely impossible, just a low probability of effectiveness from year to year. We need only to look at the 2007-2008 flu vaccine to confirm my point exactly. The second point of my reasoning is that I believe that we must encounter the influenza virus head-on from time to time (yearly, every other year, whatever) to develop natural immunity. I believe that each time we get sick with the flu, we are exposed to the latest strain, the latest mutations if you will. This is necessary to keep our immune system up-to-date, much like downloading the latest updates for your virus scan. 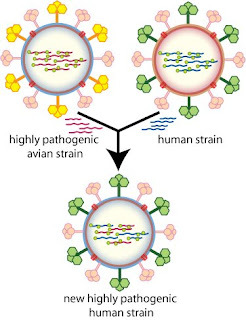 This provides a degree of protection against new flu strains that arise as a result of their constant mutation. Case in point: Experts now say that the H1N1 swine flu virus is not a new virus. Instead it’s a mutated hybrid of human, pig and bird flu strains; and that it has probably been circulating undetected for years. Somewhere, maybe in Mexico, maybe in Asia, it made the jump from swine to humans. The three most recent flu pandemics–1918, 1957 and 1968–started when a new avian flu virus started infecting people. Experts are saying that the current “triple reassortant virus” as the swine flu is called, is not a rapidly mutating virus–a sample from a patient in Mexico is virtually identical to samples from various U.S. states and other countries. So again I make my point: It’s important to get sick; It’s important to encounter new flu strains as they arise; mutations create potentially new bugs, and only by encountering them periodically will we develop recognition of their deadlier cousins in the future. Swine flu? It can be mild or it can be nasty; but like any other virulent microorganism, the environment is as important as the bug. So swine flu is here. It’ll kill some people, but lots of people are surviving it now, and many more will continue to do so. Just take care of yourself. Get lots of rest, stay hydrated, stay away from immune lowering toxins like narcotics, heavy alcohol or loads of pharmaceuticals. And if you smoke…well just know it lowers immunity. And don’t freak if you get the flu, or the swine flu; same as usual, sleep, water, nourishing food–you’ll be fine. One Response to So What if You Encounter Swine Flu? Well, said. We haven’t been around for the last 50,000 years in (more or less) our current form without knocking aside an infection or two. I think that makes us pretty capable of taking care of this one, you know?